Prime Minister speaks with President-elect Trump after election, looks forward to working together. Prime Minister Binyamin Netanyahu spoke with American President-Elect Donald Trump over the phone Wednesday night. Netanyahu congratulated Trump on his victory and said that the US has no greater ally than Israel. The Prime Minister's office said that 'The two leaders, who have known each other for many years, had a warm and cordial conversation. The conversation addressed regional issues. 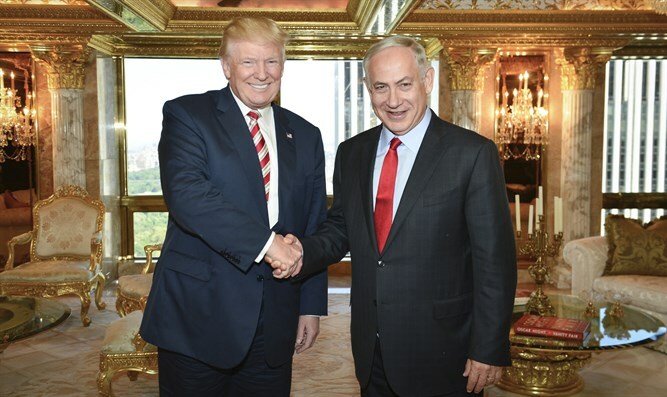 Preseident-Elect Trump invited Prime Minister Netanyahu to a meeting in the US at the earliest possible time." Netanyahu told Trump that his wife, Sarah Netanyahu, also wishes to meet with Trump's wife, Melania. Netanyahu released a video congratulating Trump earlier in the day. In the video, Netanyahu called Trump "his friend" and "a great friend of Israel. He said that he looked forward to working with Trummp "to advance security, prosperity, and peace."